The Inspired Treehouse – This outdoor sensory motor scavenger hunt for kids is the perfect way to explore the sense and the outdoors! One of my favorite memories from childhood is going out on walks with my mom, collecting leaves, sticks, and other bits of nature along the way and then assembling it all into a “nature collage” when we got home. As a pediatric therapists, we like to put a different spin on activities for kids like this one, creating new ways to target skills that are important for child development. Today, we’ll take the traditional nature scavenger hunt for kids to a whole new level! 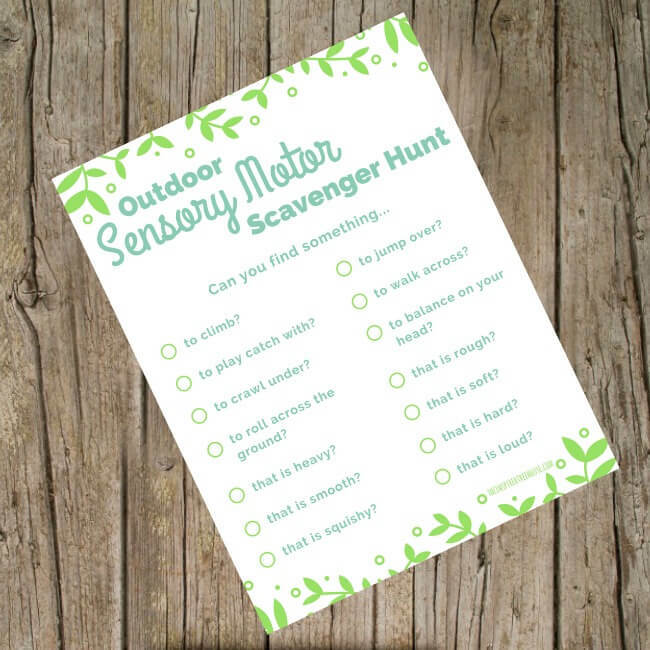 This Outdoor Sensory Motor Scavenger Hunt will get kids moving, touching, listening, noticing, and interacting with the outdoors in a totally different way! 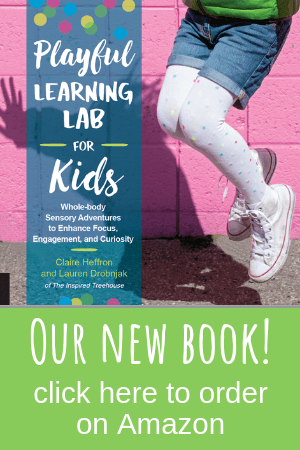 It’s a great way to show kids how to explore many of their sensory systems at once! Print the scavenger hunt list, round up your little ones, and head outside! Give everyone a pencil or crayon to bring along so they can mark off the things they have found. The kids will notice right away that this isn’t just any old scavenger hunt. Rather than just finding and collecting items on a list, they’ll have to find the listed objects and perform a variety of gross motor tasks. They’ll use all of their senses, looking, touching, and maybe even getting a little messy along the way. Who will be the first one to find everything on the list? -Make it a photo scavenger hunt! Take a picture of your child performing each activity and pictures of each of the items they found to complete the list. -Make it a team effort – have two groups competing against each other to find everything on the list! -Too windy or rainy to play outside? No problem! Try this same scavenger hunt in the classroom or around the school building or around the house! But definitely give it a try outside in the snow during the winter months! Did you like this scavenger hunt? 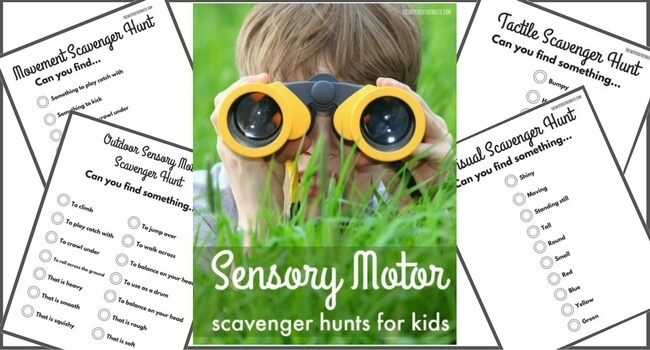 Check out the whole Printable Sensory Motor Scavenger Hunt Pack! This great little activity pack has scavenger hunts for looking, listening, feeling, and moving! This will be great for children of all ages! Hi Heather! Thanks so much for stopping by! :) Hope you guys have fun with the scavenger hunt – my boys LOVED it! Glad to find out about Krafts and Kiddos! We’ll be following you too! What a great idea – we love scavenger hunts and this is a fresh take. Just printed my copy and shared on FB! I just came across your fun scavnger hunt via Danya Banya’s Facebook page. I think my three children will have so much fun doing this. Thank you for sharing. Hi Elise! We’re so glad you liked the Sensory Motor Scavenger Hunt! Our kids had a blast with it – we hope yours do to! :) Thanks for taking the time to leave a comment! 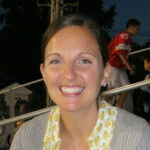 I am a mom with an almost 6 year old with SPD, always looking for new resources. 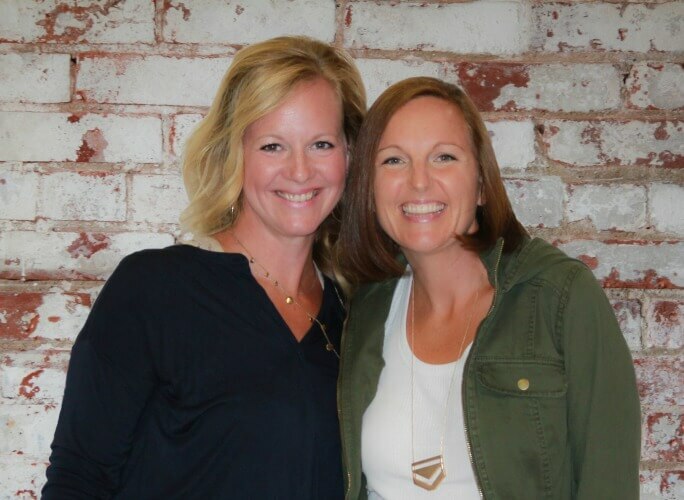 Hi Best…we are so glad you found us! Welcome to The Inspired Treehouse! This is a great list! I love how simple each idea is and I know my boys will love checking each one off. This definitely warrants a trip to the park soon. Thanks for sharing! Thanks so much for this great idea! My son’s birthday party is this weekend and he is a SPD kiddo, so he LOVES anything sensory! I am printing out your printable today (thanks for that, too!) so the kids can play this game. I just finished watching this great video and found so many creative tips and ideas on design. Thanks for sharing that was a great idea. Thank you! I am an SLP and find these so useful and so conducive for language experiences and enrichment ov vocabulary! Thank you so much! 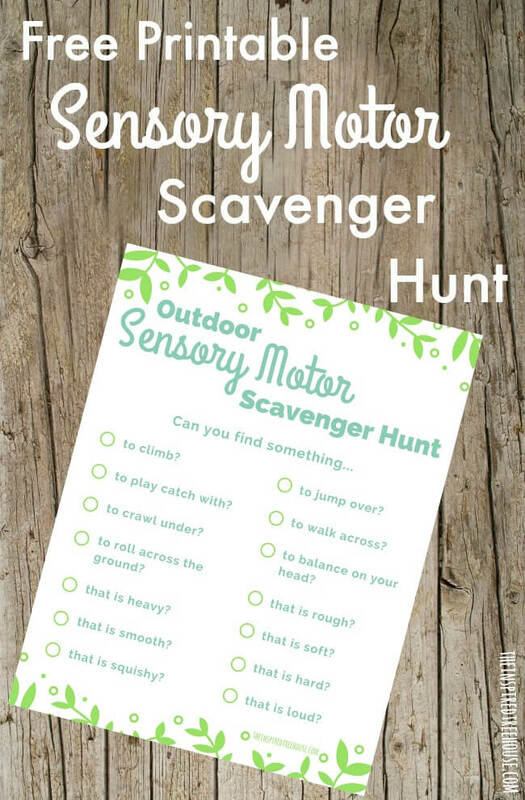 We recently did your sensory motor scavenger hunt. I’d like to do the others that you talked about in your post but when I click on the link it only gives me your clinical document? I have an autistic son and think these scavenger hunts would be great for him and our family. Hi Nedra! So sorry about this – no idea where that weird link came from!? I’ve just updated the link in that blog post, but here it is for your convenience :) Thank you!